Based on the DC Comic-Book Created by John Broome, Bill Finger, Gil Kane & Martin Nodell, Producers – Greg Berlanti, Donald De Line & Lauren Montgomery, Music – Christopher Drake. Production Company – Warner Bros. Animation. Director – Christopher Berkeley, Screenplay – Michael Green & Mark Guggenheim, Animation Director – Jiro Kanai, Art Direction – Osamu Masada. Director – Lauren Montgomery, Screenplay – Peter J. Tomsei, Based on the Comic-Book Story New Blood by Chris Samnes & Peter J. Tomsei, Animation Director – Manabu Akita, Art Direction – Yusuke Yanagisawa. Director – Jay Oliva, Screenplay – Eddie Berganza, Based on the Comic-Book Story What Price Honor by Travis Charest & Ruben Diaz, Animation – JM Animation, Animation Directors – Jin-Gon Kim, Jung-Won Ma & Syung-San Park. Director – Jay Oliva, Screenplay – Dave Gibbons, Based on the Comic-Book Story by [Uncredited] Alan Moore, Animation Director – Toshiyuki Kanno, Art Direction – Toshiyuki Shimizu. Director – Christopher Berkeley, Screenplay – Geoff Johns, Based on the Comic-Book Story Tygers by [Uncredited] Alan Moore and Kevin O’Neill, Animation Director – Yoshiharu Ashino, Art Direction – Kazuko Katsui. Director – Lauren Montgomery, Screenplay – Alan Burnett & Todd Casey, Story – Alan Burnett & Geoff Johns, Producer – Eiko Tanaka, Supervising Animation Director – Takashiro Tanaka, Animation – Studio 4oC. The Guardians of Oa detect a powerful new threat in the return of Krona, a former Guardian who was banished to the anti-matter universe. Krona is now emerging from Oa’s sun and sending out hordes of Shadow Demons composed of negative energy. The Guardians decide to abandon Oa and move base to another planet. While helping do so, Hal Jordan tells stories of various members of the Green Lantern Corps to the rookie Arisia. The First Lantern:- When the Guardians first created the Green Lantern rings millennia ago, the first four rings were sent out to choose their wearers. The surprise fourth recipient was the lowly scribe Avra. As they were sent into action to tackle an alien invasion, Avra’s willpower and imagination proved to be what unexpectedly saved the day. Kilowog:- Hal tells the story of the tough drill sergeant Kilowog from when he was a recruit. His even tougher instructor Sergeant Deegan took them on a punishing training mission. Kilowog determined to prove himself despite Deegan’s attempts to break him. Laira:- The Green Lantern Laira returned to her home planet Jayd where she was shocked to see that the former invading Khunds had been brutally repressed. She was then even more disturbed to discover that the one behind this was her father Kentor, the planetary ruler. Mogo Doesn’t Socialize:- The bounty hunter Bolphunga the Unrelenting was told that the only person he would not be able to defeat in a fight would be the Green Lantern Mogo. Bolphunga immediately set out to the planet where Mogo was supposed to be but was driven to wit’s end by a frustrating quest to find Mogo’s whereabouts. Abin Sur:- Abin Sur tackled the rampaging Atrocitus who was attempting to kill all Green Lanterns. 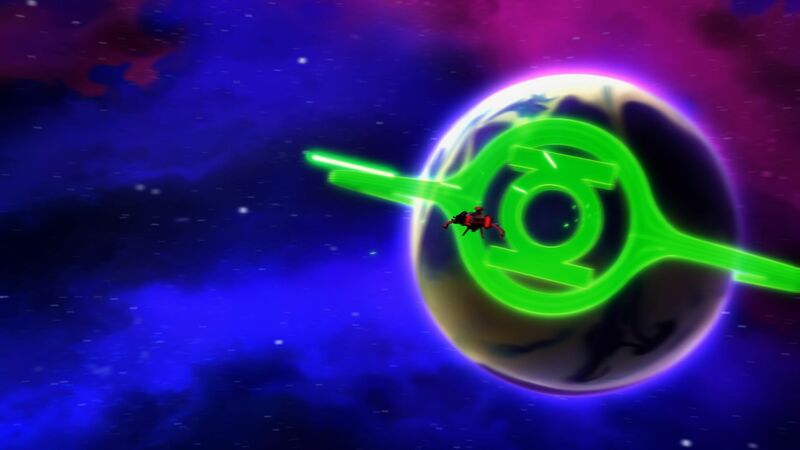 Apprehending Atrocitus with the help of Sinestro, Abin Sur escorted him back to the prison planet where Atrocitus delivered a dire warning about the future. 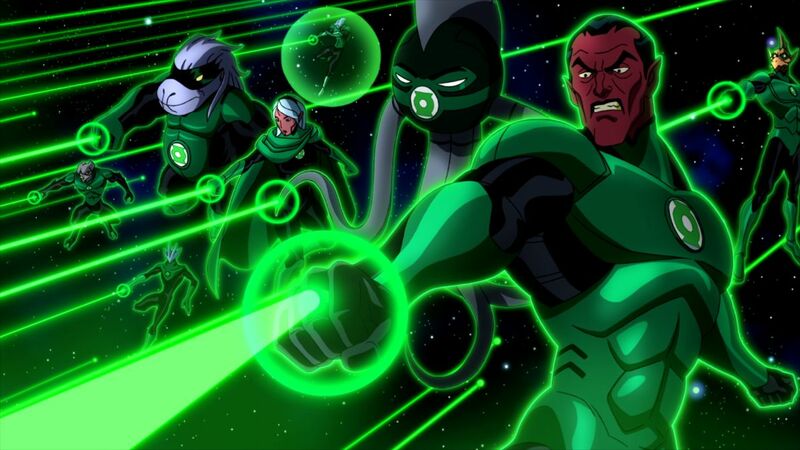 Green Lantern: Emerald Knights was one of the films from Bruce W. Timm’s DC Universe Original Animated Movies. Timm began in the 1990s with animated tv series based on DC superhero properties such as Batman (1992-5), Superman (1996-2000), Batman Beyond/Batman of the Future (1999-2001) and Justice League/Justice League Unlimited (2001-5). In the 00s, these were expanded out in a series of dvd-released films often adapted from popular DC graphic novels with the likes of Superman: Doomsday (2007), Batman: Gotham Knight (2008), Justice League: The New Frontier (2008), Superman/Batman: Public Enemies (2009), Wonder Woman (2009), Batman: Under the Red Hood (2010), Justice League: Crisis on Two Earths (2010), Superman/Batman: Apocalypse (2010), All-Star Superman (2011), Batman: Year One (2011), Batman: The Dark Knight Returns Part I (2012), Justice League: Doom (2012), Superman vs. The Elite (2012), Batman: The Dark Knight Returns Part II (2013), Justice League: The Flashpoint Paradox (2013), Superman Unbound (2013), Batman: Assault on Arkham (2014), Justice League: War (2014), Son of Batman (2014), Batman vs. Robin (2015), Justice League: Gods and Monsters (2015), Justice League: Throne of Atlantis (2015), Batman: Bad Blood (2016), Batman: The Killing Joke (2016), Justice League vs Teen Titans (2016), Batman and Harley Quinn (2017), Justice League Dark (2017), Teen Titans: The Judas Contract (2017), Batman: Gotham By Gaslight (2018), The Death of Superman (2018), Suicide Squad: Hell to Pay (2018), Justice League vs The Fatal Five (2019) and Reign of the Supermen (2019). Green Lantern was previously incarnated in Bruce Timm’s Justice League tv series, although in that version Hal Jordan was replaced by the lesser known African-American Green Lantern John Stewart in order to add racial diversity to the line-up. Prior to this, Timm and co had conducted an animated Green Lantern film spinoff with Green Lantern: First Flight (2009), which told a Green Lantern origin story but went with the more familiar Hal Jordan incarnation. The Hal Jordan origin story was also covered slightly differently in the Justice League film Justice League: The New Frontier. Green Lantern: Emerald Knights was a portmanteau of stories about various members of the Green Lantern Corps that was designed to accompany the big-budget live-action film Green Lantern (2011) and was released ten days earlier. Around the same time, Warner Brothers also made the tv series Green Lantern: The Animated Series (2011-3). The first story, The First Knight, is one of the few in the compilation that is not taken from an existing Green Lantern comic-book story – in fact, the character of the first Lantern Avra has been created for the film and has no correspondent on the printed page (unlike all the other characters that feature in the individual stories here). The story is a minor one based around the triumph of the nerdy underdog. The piece eventually succeeds when it comes to the superheroic action scenes where we see Avra using his ring to blast apart an entire invading alien fleet and create a sword that cleaves a giant alien mothership in two. This has some of the epic-sized action that you wished the live-action film had discovered. The second story gives welcome time over to the character of Kilowog and turns things on its head to show the normally tough character as a rookie. The character of Sergeant Deegan is loosely based on the Green Lantern Corps drill instructor (and Kilowog’s trainer) Ermey. The entire episode is a basic variant on the grunts in training story. Henry Rollins does well in the title role. The episode also climaxes on another epic-sized battle scene with the recruits in action against alien invaders. Laira is an adaptation of What Price Honor (1993), an issue of Green Lantern Corps Quarterly that focused on the background story of the female Green Lantern Laira of Jayd. Laira offers up a more simplified version of her story – alas, on screen both she as a character and the story are not terribly interesting. Laira has the misfortune to be the third episode in a row of Emerald Knights that is depicting an alien invasion and by now this is starting to fade into a much of a muchness. The story serves well enough in its own right but most of the early half feels like no more than a sequential string of fight scenes. The standout among the episodes is Mogo Doesn’t Socialize. This is adapted from Mogo Doesn’t Socialize (1985), which appeared in Green Lantern #188 and was written by no less than Alan Moore, whose work has been adapted into films such as From Hell (2001), The League of Extraordinary Gentlemen (2003), V for Vendetta (2006) and Watchmen (2009). Alan Moore notoriously refuses to take any credit on his film adaptations and so the story here is credited only to Dave Gibbons who acted as penciler on the original strip and returns to adapt the script here. The story is one where Moore was having fun with how far he could stretch the concept of just what a Green Lantern entails. The episode is essentially a build-up to a shaggy dog punchline of the revelation of Mogo’s true nature, although tends to get lost if one is familiar with Mogo who makes semi-regular appearances in other Green Lantern stories (and indeed becomes the seventh cavalry at the wrap-up of the framing story here). Abin Sur comes from another Alan Moore story Tygers (1986), originally published in Green Lantern Corps Annual. I am not sure what the original story consisted of but the film version is a slim one, which simply consists of Abin Sur defeating Atrocitus, escorting him to a prison planet where Atrocitus then delivers a prophecy of things to come. These things make more sense when one knows something of Green Lantern continuity but outside of alluding to the wider background story canvas for the comic-book fans, the episode is slight as a story. It also strains credibility that Sinestro, who later turns traitor to the Green Lantern Corps, would be narrating a story that foretells his own treachery. The wrap-up frame does finally get things together for an epic-sized battle with Krona.